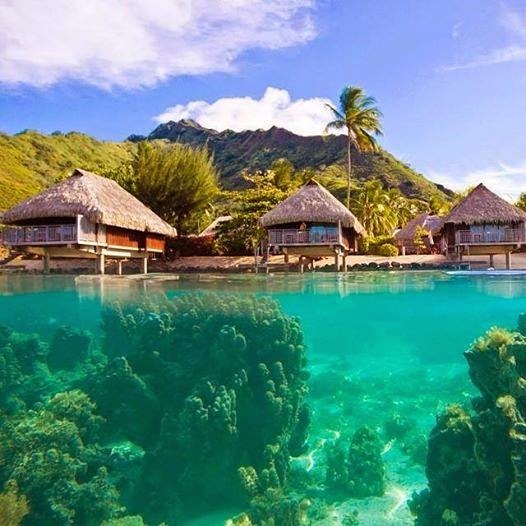 Moorea is a volcanic island in the French Polynesia, with about 132 km² of area. Distant only 19km from the Tahiti. Moorea's rugged dramatic beauty is attributed to an explosion of a great volcano in the past. In the center of the ancient crater stands the Mount Rotui that shares the environment with other six mounts. White sand beaches with crystal and calm waters complete the scenario. Today, the island has about 12,000 residents. They live mainly from agriculture, fishing and tourism. Afareaitu, the main village, is in the Moorea's east coast. It is Polynesia's second-most popular tourist attraction after Tahiti. See a map of French Polynesia. Moorea, volcanic island, second largest of the Îles du Vent (Windward Islands) in the Society Islandsof French Polynesia, central South Pacific Ocean. The island, the remains of an ancient, half-eroded volcano, lies 12 miles (20 km) northwest of Tahiti. It is triangular, rugged, and mountainous, with many streams and fertile soils. Its highest peak is Mount Tohivea, at 3,960 feet (1,207 metres). The chief village, Afareaitu, lies on the east coast overlooked by Muaputa (2,723 feet [830 metres]). Cook (Paopao) Bay and Opunohu (Papetoai) Bay, divided by Mount Rotui, are on the north coast at the centre of what was once the volcano’s crater; Haapiti town is on the west. The American writerHerman Melville traveled to the region in the 1840s, and some villages on the eastern coast of Moorea became the models for the Tahitian villages in his novel Omoo (1847). The island’s chief crops are vanilla, copra, and coffee. Moorea is now a favoured tourist location. Area 51 square miles (132 square km). Pop. (2002) 14,226.